Like, will I ever see you again? I’m outta cheese here. It seems like acting is somewhat like special effects. You usually only notice it when it’s bad. When the actors are doing their jobs well, you may not even notice. It just seems natural. Author nalterPosted on September 16, 2008 Categories moviesLeave a comment on Like, will I ever see you again? "Is my name on the other side of this fortune?" We saw King of Kong last night on Netflix Watch Instantly. (Netflix needs a better name for the service.) Amusing documentary about some dudes obsessed with breaking old videogame records. It was like professional wrestling mixed with super-nerdity. Incidentally, Billy Mitchell went on to beat Steve’s record before the movie was even released. Now Steve’s trying to beat his record. Anyway, once you’ve seen it, you are amongst the tiny audience that would get the reference on this shirt. Author nalterPosted on September 4, 2008 Categories humor, movies, videogamesLeave a comment on "Is my name on the other side of this fortune?" We watched 20,000 Leagues Under the Sea. (At least, I did…it didn’t interest Vanessa and Sean much.) Anyway, if this 50s movie were made by Disney today, all their food would be politically correct, and derived from seaweed, or kelp or something. But Captain Nemo in this movie loved to eat him some sea animals. I’d think he could have figured a better pudding than one made out of octopus. Author nalterPosted on July 8, 2008 Categories language, moviesLeave a comment on Auwe! We watched Flight of the Navigator last night. The movie briefly showed a music video involving some men throwing around a turkey. It is Lose Your Love by Blancmange. Vanessa found that biscotti are so hard because they are twice (bis) baked (cotti). They seem to be targeted at dipping in coffee. I had always wondered why anyone would make such a tough cookie. Now I know. I found Exit for PSP on sale for $9. It’s a puzzle platformer…sort of a cross between Lemmings and Super Mario Brothers. Seems pretty fun so far. what did Clark see in her? There is a scene in the movie where Lois Lane’s beauty is “so great that it blurs the camera”. Has Superman the glaucoma? Earlier in the movie, we see a chance encounter between the young Clark Kent and the young Lois Lane. She’s about 10 years younger than him at that point. Then later in the movie, she appears about 10 years older than him. Maybe Superman ages well? To be fair, Margot Kidder was only 4 years older than Christopher Reeves. Vanessa dropped Sean and I off at the mall Saturday. We rode the bus home because Sean had been wanting to do that for a while. He enjoyed sitting in the “elbow” of the bus, which rotates like a merry-go-round in turns. Have you noticed there are no longer merry-go-rounds or teeter-totters on playgrounds anymore? Look at me using these old dashed words. Next thing you know, I’ll be saying jack-o-napes. Anyway, I assume someone sued a city somewhere for a merry-go-round incident and it was all over. Sean still finds a way to make his own danger on the playground by making 5 foot jumps from the playset. He’s only 3, so that’s quite a jump for him. it makes me cry. There seemed to be something like four little pieces that all have to be carefully held together as you put it back together. In the end, Vanessa had to help me hold one half of it together as we put it back together. The inside is pretty empty without the rumble hardware, which will be put back in starting Spring 2008, they’re saying. We saw Monster House yesterday on blu-ray. Definitely too scary for kids. It had the flavor of The Goonies (also from Amblin). The making-of videos showed how the entire movie was acted out via motion capture. I wonder if it saved time and money. I’m guessing it did. I think a lot of computer animators are up in arms because of motion capture. Pixar put an “animated by hand” disclaimer on the end of Cars. I say it seems kind of silly to hold things back like that. Motion capture gives a better end result if you ask me. Anyway, animators still have to touch things up. It sounds like single-speed bikes are becoming popular. Like the Mac with one mouse button, it’s a bike with one gear. No shifting. I suppose my mindset is fundamentally different. When I get a gadget or device, I try to learn everything about it to use it to its maximum potential. I learn all the hotkeys and shortcuts and how to use every little feature. (I’ve been giggling like a schoolgirl as I add pictures to the contacts on my cellphone.) On the other end of the spectrum are people who just want to use the thing intuitively. They don’t want to right-click, change gears, hot key, or bother with anything that isn’t obvious. Unfortunately, it seems a very slow process for many things to advance to a state of intuitive use. So I guess the trade-off is that I can use the device more fully now, but end up with useless knowledge when it becomes easier to use. If computers get to the point where they’re voice-controlled and don’t just say “I’m sorry, I didn’t understand that” to every voice command, you’ll be laughing at my shortcut key knowledge. Speaking of unintuitive things, we’ve now watched a couple of blu-ray movies. Hoosiers and 8 Below. The quality is definitely better (of the picture, not the movies). Text is perfectly sharp. You seem to notice it most when you put in a normal DVD and see the difference. 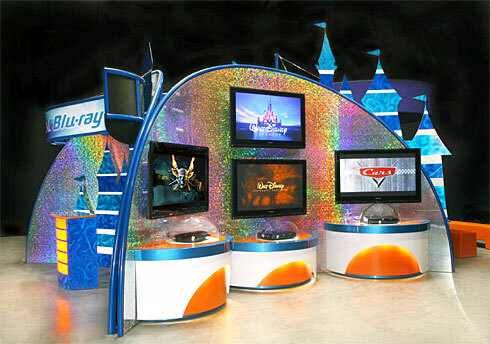 Disney is actually bothering to do a mall tour around the US to “educate” people about blu-ray. I can see see it now. Ironically, we’ve not bought a single game disc for our PS3 yet. I don’t even have time to play through all the demos I downloaded. We watched Ratatouille the other day. The story of a famous chef selling out seems to be somewhat based on Chef Boyardee, who’s mentioned in the movie. 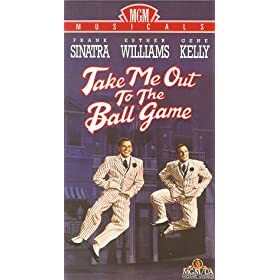 We watched Take Me Out to the Ball Game from 1949. Frank Sinatra was my age in that movie but looked more like 40…I think due to smoking and extreme tanning. Mind you, I’m only six years away from 40 myself. The movie? It’s yer standard musical.